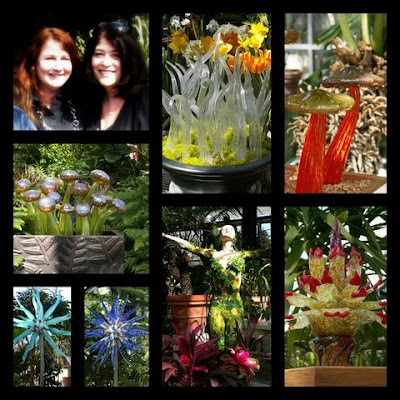 Today my intrepid garden explorer friend, Amy, and I headed off to Planterra in West Bloomfield for a Botanical Glass exhibit. I invited Joey to meet us, but didn't think she'd be able to make it, so it was a wonderful surprise when she and Mr. Ho Hum showed up! I really liked the glass artwork, which was created by artists from Furnace Design Studio in Dearborn, and how it was displayed among colorful flowers and striking foliage. But I couldn't help but noticed how many pieces were strikingly similar to Dale Chihuly's work. I mean, really similar. This is a wonderful collage Joey made, and her post about the event is here! The glass artwork in the second video is really cool and that living wall with the bromeliads is nice! Almost makes me want to get one. HA! Wonderful glass. Are you familiar with the work of Hans Fodo Grabel? He did a display at Lewis Ginter Botanical Garden last year that was neat. See http://www.frabel.com/exhibitions/glorious-glass-garden for a few photos. Flowers and glass make a nice combination. Thanks for sharing. Beautiful Monica! Looks like a fantastic day. A lot of the glass looks very reminiscent of Chihuly to me too. I looked at the links about Planterra and the studio. This is a really nice event and I hope a lot of people attend! I liked the hanging terrariums that looked like gourd birdhouses. Thanks for the pictures! I like the idea of glass in the garden but it really isn't practical. Heck glass in my house isn't practical. I just broke a glass terrerium that I have had for several years. Made me so mad at myself. I liked your videos. You know what they say, copying is the greatest form of flattery. They do look very similar to Chihuly's work, but then why not copy the master? Ever since I saw the Chihuly exhibit in Phoenix two years ago, I've thought how lovely a piece of glass art would be in the garden. But I couldn't afford even those little flowers:) And it wouldn't be very practical--with Sophie galloping around, it probably wouldn't even last a day in my garden. Great pics ... very impressed and a lovely afternoon, Monica. Grins, während Du bei mir im Garten warst, habe ich hier auch gleich die Glaskunstwerke bestaunt. Echt erstaunlich was es alles gibt. Erinnert irgendwie an die Welt von Alice im Wunderland. I wish I could visit and see the beautiful exhibit myself. The green wall and hanging glass terrariums are very impressive. You asked, if I am going to the Bundesgartenschau 2011 in Koblenz? Did you see the pictures on my blog from our Canada Blooms cocktail party?? I am planning to attend the "Seattle Fling" bloggers meeting in July!! Like MrBrownTumb I especially liked the second video, although my favorite pieces were the mushrooms in the first. Very nice! Beautiful artworks! And they look so spectacular among the plants. Wish I could visit too, but a little too distant! This is a wonderful exhibit. I was glad you made the video. Such beautiful work and so colorful. Some of them really looked like the plants too.